Since launching in 2010, more than 2000 contributors have written for LSE’s public-facing academic blogs, reaching an ever-expanding, international audience. But how do we measure the impact of this particular form of research communication? In the first of a short series of posts, Carlos Arrebola and Amy Mollett introduce the Impact of LSE Blogs project. As well as following the progress of the project here on the Impact Blog, you are also invited to join us at a dedicated event at LSE on Wednesday 14 June! For centuries, the only option for academics and researchers looking to get their work published was to rely on academic publishers. It is only in the last decade that this has changed, with open access platforms such as socarxiv, arxiv and institutional repositories now offering the possibility of instantly putting research at the fingertips of anyone with an internet connection. It is also the case that up until the last decade or so, the only outlets that could report on research in lay terms were the mainstream media. But that too has changed. Social media and blogs across the spectrum of academic disciplines offer the possibility of sharing research with a broader, non-specialist audience, as well as traditional academic readers. Academic blogs allow many of us to engage with new audiences to discuss ideas, promote activities, or even publish original research in a timely fashion without ever even being submitted to an academic journal. In this new landscape, the academic of today has many options for communicating the findings of their research: whether to discuss ideas and results in a blog post, upload a working paper before submitting it to a journal, or to use social media to share their findings on the big story of the day. It is in this context that our project at the London School of Economics has sought to investigate the role of social media in research communication – specifically, the role of LSE’s public-facing academic blogs as channels of academic communication. The project aim is to help us – and our contributors – better understand the platform that we use to communicate academic work and inform our decisions on how to use it. Although there is evidence to suggest that academics have not yet embraced the full potential of social media (see, for example, Mas-Bleda et al, 2014), it seems that the use of these communication channels is growing, not only in general, but particularly in the context of LSE’s blogs. 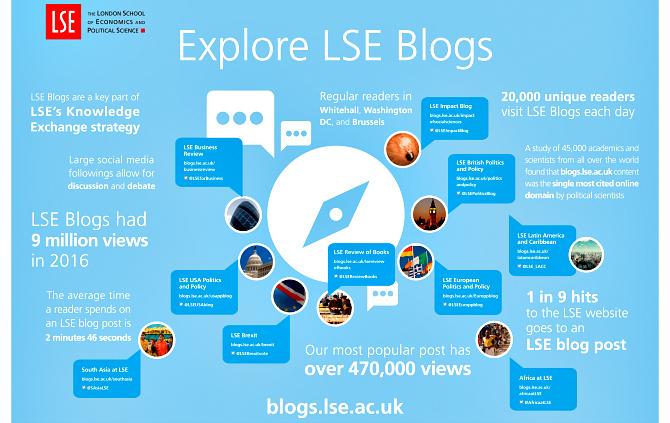 Since the launch of the first blog in advance of the 2010 General Election (which later became LSE British Politics and Policy), LSE blogs have grown into a very successful platform, providing evidence-based commentary, accessible summaries of academic research, and two-way dialogue between readers and authors. The blogs now collectively reach over 150,000 readers a week in more than 190 countries across the globe. They have become something of a flagship for LSE, accounting for one of every nine visits to the LSE website (data based on Google Analytics reports for the past year). While these figures highlight a great deal of interest in the blogs, there remains a question mark over quite how impactful they are. This project aims to better understand the impact our blogs have. “Impact”, as regular readers of this blog will know all too well, can be tricky to define. In the past it has been thought of as an endogenous academic concern, considered in bibliometric terms; scholars would have impact if their peers cited their work in subsequent publications. However, many people, quite understandably, found this to be very limiting, and so came calls to consider the impact of research in much broader terms, beyond academia. In the UK, these calls were heeded, as is perhaps best demonstrated by the Research Excellence Framework’s definition of impact: “[the] effect on, change or benefit to the economy, society, culture, public policy or services, health, the environment or quality of life”. Consequently, in analysing the role of LSE’s blogs in contributing to the impact of academic research, we have considered the notion of impact in its broadest sense. With all of our blog posts being freely available and written to appeal to an educated general audience, our readers and users are not only academics but come from right across the public/private spectrum: public authorities, journalists and individual readers with an interest in a variety of academic topics. In a series of forthcoming posts on the Impact Blog, we will present the findings of this project and explore the effects that LSE’s blogs have had on a range of different actors across this public/private spectrum. We will consider how and by whom LSE blog posts are used and cited in the public realm, following up on high-profile citations in politics or references in mainstream media. Moreover, we will analyse the impact of LSE Blogs on the academic sphere by: (i) understanding the role of our blogs in the success of the journal articles they are based on; and (ii) how the blog posts themselves are cited in academic publications. Finally, findings will be presented at a dedicated event, to be held at LSE on 14 June, where a variety of experts across different panels will discuss the role of social media in research communication. We invite readers to follow this project as we unveil the findings in future posts and via other social media. What about the effects of blogging beyond academia, on the public sphere? Kieran Booluck recounts some examples of how LSE blogs have helped primary academic research to be discovered and used, and also revisits those posts that have demonstrated the blogs’ huge potential to extend the reach of research. Amy Mollett is Social Media Manager at the London School of Economics and Impact of LSE Blogs Project Manager. She is co-author of the new SAGE book Communicating Your Research with Social Media. She previously managed several blogs at LSE, including LSE Review of Books and the Impact Blog. With her co-authors, Amy has won a Times Higher Education Award for Knowledge Exchange. Amy is a graduate of the London School of Economics and the University of Sussex. She tweets @amybmollett.